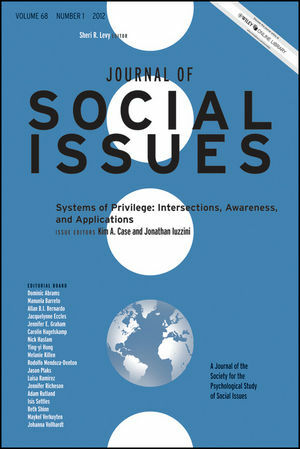 This issue explores conceptualizations of various forms of privilege and the psychological and behavioral consequences of privilege with an emphasis on policy implicatiosn and intersectionality. The contributions focus on theoretical advances and the integration of science and action in order to extend our current understanding of privilege. Kim A Case, PhD, is an Associate Professor of Psychology and Women's Studies and Director of the Teaching-Learning Enhancement Center at the University of Houston-Clear lake. She is also Director of the Social Issues sub-plan in the Psychology Master's program and chair of the Women's Studies program. Her research on prejudice confrontation and ally behavior focuses on dominant group responses to prejudice based on race, sexual orientation, and gender identity in social contexts. She also studies strategies for raising awareness of heterosexual, gender-conforming, male, and white privilege in education and community settings. Jonathan Iuzzini is Coordinator of the Teaching Creativity Center and the Honors Institute at Monroe Community College. His research has been published in Journal of Personality & Social Psychology; Journal of Experimental Social Psychology; New Directions for Teaching & Learning; and To Improve the Academy. He has previously served the Society for the Psychological Study of Social Issues as co-editor of the society Newsletter and as Chair of the Graduate Student Committee. Section II: Intersectionality and Context. Section III: Interventions and Ally behavior.